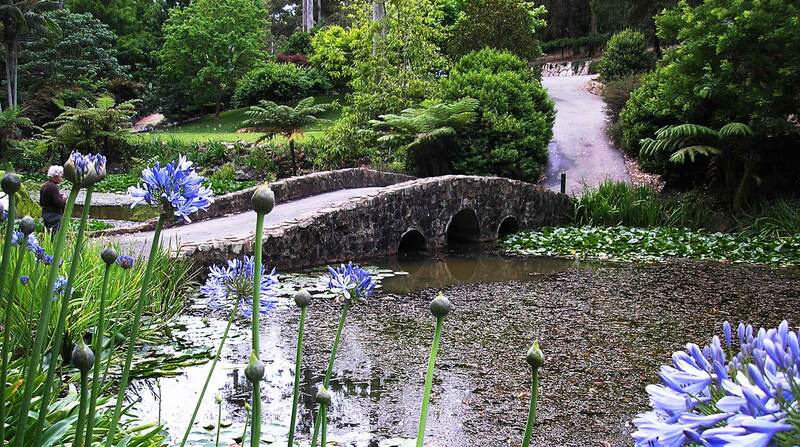 In November 2016 Tamborine Mountain Gardens were the Featured Garden in the publication. The article written by Club member and volunteer Denby Browning is reproduced for your reading pleasure. Although this a longer than usual Journal Post we hope you will take the time to be inspired by this history of The Botanic Gardens. Imagine this. It is 1982. 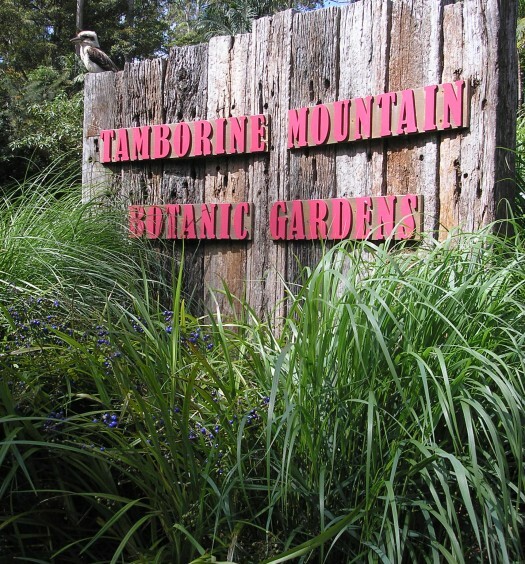 You are a member of the recently-formed Tamborine Mountain Garden Club (TM Garden Club), a group of 40 individuals. You read a short article in a local newspaper suggesting the construction of a community garden on land owned by the local council. It is 11 hectares of hillside and a swampy gully infested with lantana and other weeds – and snakes – previously earmarked for a sewage treatment works but rejected by mountain residents. You and some of your gardening enthusiast colleagues decide you can take on this challenge. You meet onsite just six months after your first club meeting and agree with council to begin work. Council offers a couple of workers and some machinery but no funding. Volunteer-built gardens everywhere face a singular problem – money. It is the reason why so many eventually fail. Over time, the need to raise funds saps the great will of the volunteers. 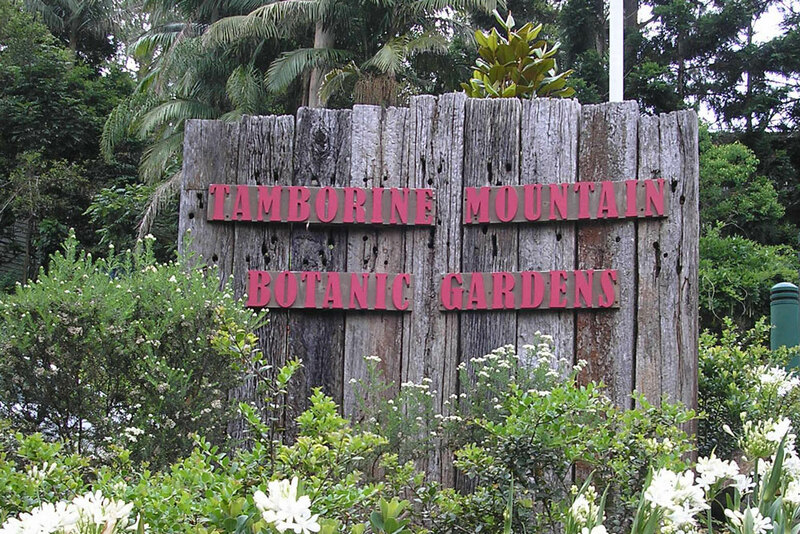 The Tamborine Mountain Botanic Gardens (TMBG) is listed on TripAdvisor as the top visitor attraction for the region. The gardens are fully run by volunteers and the local Council provides weekly ‘park maintenance’ services. A band of 25 volunteers work every week to maintain and improve a vibrant natural showcase. And there is enough money in the bank to cover virtually any calamity. TMBG is listed on TripAdvisor as the top visitor attraction for the region. The gardens are fully run by volunteers. With an eye to expanding their knowledge and a desire to share information, TMBG management joined as members of BGANZ in 2010. Tamborine Mountain is 40 kilometres north of the New South Wales border, yet its elevation of approximately 600 metres keeps average temperatures about five degrees below the coast and results in lower humidity as well. Thus it offers a temperate rather than a sub-tropical climate. Most of TMBG volunteers –though not all – still come from the TM Garden Club and the club plays a vital role in the management of the gardens. The two volunteer groups working in tandem is perhaps unique in botanic gardens structure. 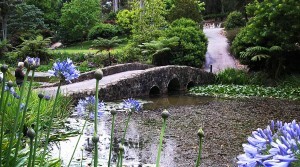 With this unique environment, the team at TMBG has worked to develop relationships with garden clubs and botanic gardens throughout Australia. With a particular eye upon the threat that bushfires in regional Victoria pose to unique species, the National Rhododendron Gardens outside Olinda in the Dandenong Ranges east of Melbourne has shared a number of vireya rhododendron species with TMBG and when the Camellia Society visited the gardens in 1998 they donated a quantity of plants. In these times of economic challenge the volunteer team at TMBG is happy to share ideas and thoughts about its funding strategies. A team from the Sunshine Coast’s Friends of Noosa Botanic Gardens visited us recently, paying particular attention to the Bobby White Potting Pavilion, a structure built especially for propagation activities. Funding to build it came from a special government grant and the Noosa team was eager to learn more about our process of grant application. The channels of funding and the way in which they have evolved over more than 30 years are the major reason for TMBG’s success. 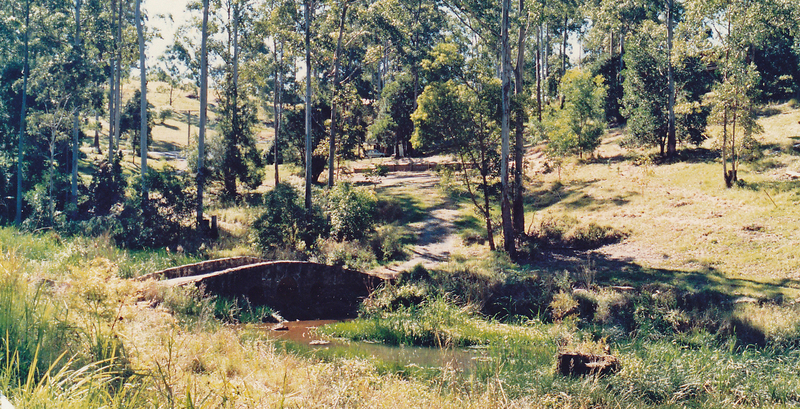 While the development and funding of the gardens relied almost entirely upon the work of garden club members for the first 25 years of its existence, the then Beaudesert Shire Council provided some support in the early years. The council bought a small block of land adjacent to the main site to provide better vehicle access. Council workers built a toilet block on the site and erected a tool shed. 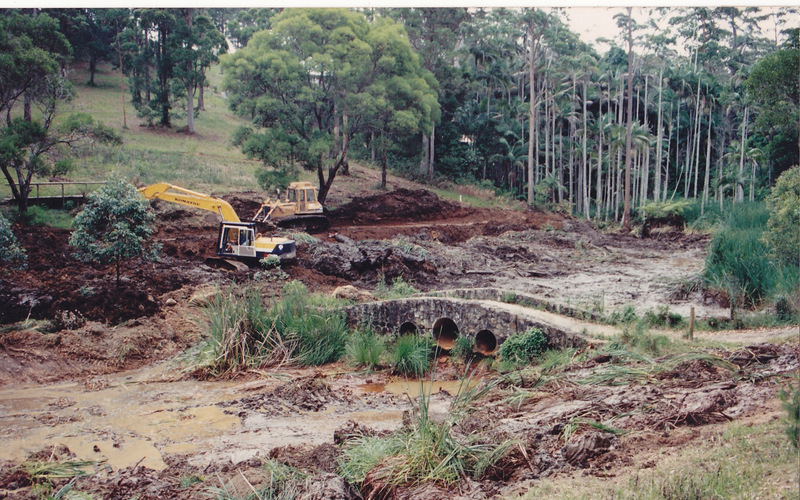 Council also provided workers and machinery when the club decided to dredge the swampy creek to create a lake. But it was not all upside and progress. A mistake during lake dredging saw an excavator slip into the fledgling lake and the recovery cost emptied the club’s coffers. Yet funding structures were in place. The club realised that cake stalls and raffles were simply not going to generate the cash the gardens would need. So members organised an annual flower festival. This event grew over the years and was a significant source of funds. But even that was not without hurdles. Various festival structures were tried – most worked to a degree, some less so. Eventually, moving away from a central\ venue in the early 2000s and focusing on private gardens proved to be a winning formula. 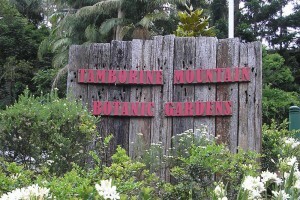 Tamborine Mountain residents were asked to open their gardens to the public over a three-day weekend in late September. Each year, new gardens are opened and a few favourites re-open. the entire region, run entirely by TM Garden Club volunteers, attracting more than 3,000 visitors over the weekend. In 2007 and again in 2015 the open gardens festival was announced as the Community Event of the Year at the region’s Australia Day Awards. It now ranks as the second largest source of funds for the gardens. Part of the money raised each year is set aside in a bank account in case of an emergency or disaster. THE FUNDING STRUCTURES IN PLACE ARE THE MAIN REASON FOR TMBG’S SUCCESS. That bank account could now entirely fund the operations of TMBG for nearly two years if all other sources of funding were to dry up. Many other funding plans have been hatched over the years. 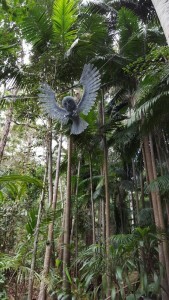 For example, a Friends of the Botanic Gardens group was launched. It raised some funds from the community but was soon abandoned as being too unwieldy to administer. TMBG management realised that, if some major projects to raise the gardens’ capacities and attractions were to succeed, government funding was needed. 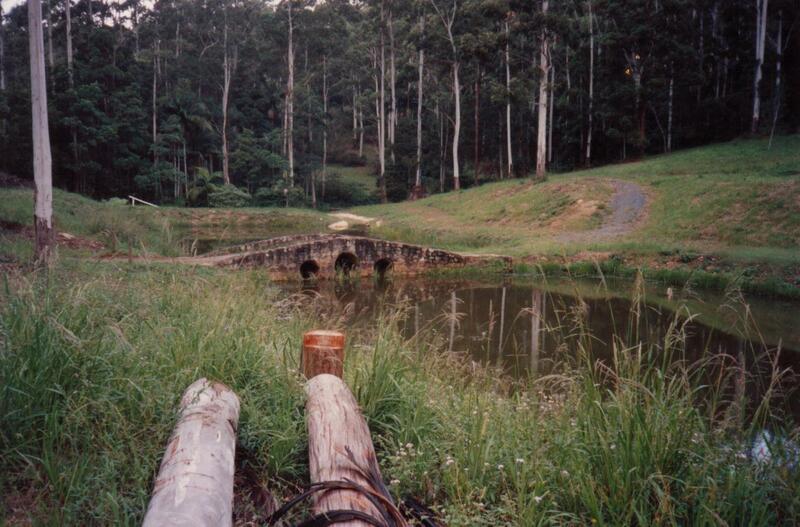 In 2006 a team approached the Beaudesert Shire Council to request a regular grant and was initially rejected. Not to be thwarted, the team tried a different tack. They approached the newly-appointed Council CEO, inviting him to visit the site. Alistair Dawson did not know the gardens existed or that council owned the property. He was immediately impressed and joined the lobbying for funding. He described the TMBG as the ‘jewel in the crown’ of the shire. The following year a grant of about $50,000 was approved but, before it could be delivered, state government disbanded the council and replaced it with a new body, the Scenic Rim Regional Council, with different borders and a new council membership. What followed was much to-and-froing of moneys extracted, promised and paid. More lobbying, more visits. A regular newsletter about volunteer activities was instituted and sent to the mayor and councillors as well as media, club members and the local community. The pressure worked. Four years later an agreement was signed for five years’ guaranteed funding of $50,000, indexed each year for inflation. Council also agreed to provide two council workers for one morning each week to help the volunteers in the gardens. That grant has since been extended for a further five years. It is the largest single source of funding for TMBG by a small margin. In the meantime, the management committee continued to innovate channels for funding. from a few dollars to a hundred or more. Today, a precise amount is requested and always provided. The higher rate has been no deterrent to couples. This rustic sign has greeted visitors to the gardens for many years. Similarly, half a dozen donation boxes are placed at vantage spots around TMBG. These elicit anything from small change to the occasional note. Recently the sign over each box was expanded from the simple word ‘Donations’ to include a request for a gold coin. In the six month after the signage was changed, the boxes elicited double the amount that had been achieved in the entire previous year! Volunteers also formed a specialist plant propagation group, aptly named the Potty Potters. They hold regular sales of seedlings and plants and operate a major stall throughout the open garden festival weekend. This results in a substantial contribution to the TMBG bank account every year. One-off grants have helped TMBG secure much-needed equipment but for many years, these were few and far between. Then a chance meeting between our club president and a state government official who encouraged the club to be more active in pursuing grants led to the appointment of a voluntary grants officer. The club and gardens now have a schedule of grant application opportunities and a measure of success. A recent Federal Government grant, for example, has resulted in a major storage shed extension. Wisteria-covered pergolas have been built alongside the lake, a rotunda on a hillside offers a delightful place for individuals and families to rest and view the site. A pavilion was built near the Gardens’ entrance to allow groups of visitors to meet and picnic under shade. Car parking facilities have been expanded and paved. Previously earthen pathways throughout the gardens have been bituminised and maintained. 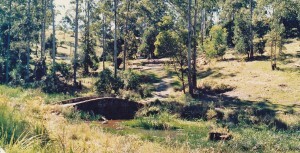 An early photo of the gardens (approx 1988) of the area showing the stone bridge. 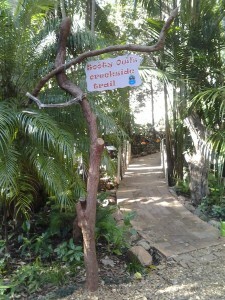 Most recently, a small group of the volunteers designed and then built a new path through a wooded area now called The Sooty Owl Walk. It has become a major attraction, particularly among young visitors who are enthralled by the ‘crooked house’ with its water wheel, a variety of small bridges and images of owls scattered among the trees. 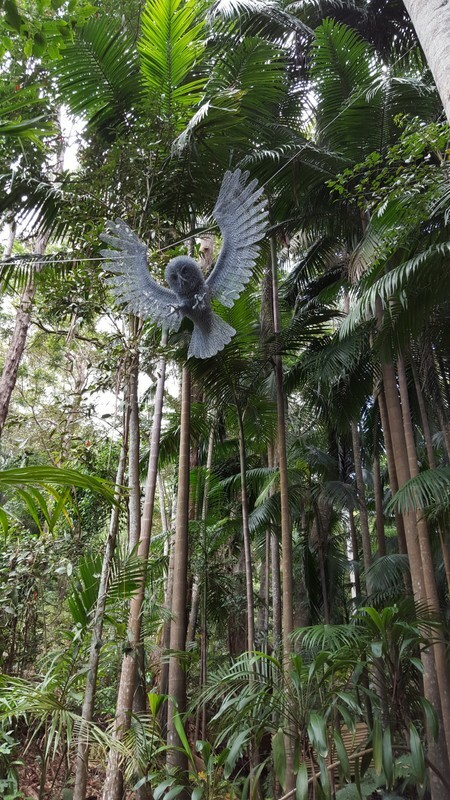 On the Sooty Owl Walk many signs exhort visitors to ’Look Up, Look Down’ and others explain aspects of the forest – a real educational feature. Aware of the need to attract a new generation to become involved, the club and Botanic Gardens volunteers have also embraced new media. The web site is constantly updated with blogs and news and a pair of volunteers recently attended a course on using social media for business. The result was an immediate spike in activity and engagement on the Botanic Gardens Facebook page. Readers began organising visits to the gardens through posts. TMBG now stands as a powerful example of what can be achieved by enthusiastic volunteers supported by a close-knit community and the determination to constantly review, refine and develop multiple sources of funding. The future is secure and the volunteers can continue with their program of development and enhancements … and hopefully grow the next generation of TMBG stewards.